Head’s up, I host this blog on Bluehost and I’m also an affiliate, so if you use my link to start your blog, Bluehost will pay me for it. The good news is that it doesn’t cost you any additional fees and Bluehost is probably the best choice out there for new bloggers in terms of cost and ease of use. You don’t have to use my link, but if you do, please know that you are an awesome human being with above average intelligence. One of the best ways I’ve grown as a person and stayed motivated with my fitness endeavors is through blogging. I’ve also built a community, made money and several new like-minded friends. It’s been a game-changer for me. Studies show that the fastest way to build a new identity for yourself is to embody the characteristics of a person who is already like that. What the hell does that mean? Simply act as if. By blogging about your fitness journey, you are not only keeping yourself accountable, you’re also reinforcing your identity as a fit person, by writing about what you’re doing. It’s powerful stuff. If you’ve ever thought about blogging, I encourage you to try it. It costs next to nothing to start up. Literally, you can get web hosting and a free domain for as little as $2.75 a month if you sign up with Bluehost (that’s who I use, and I think they’re the easiest to get started with, and the least expensive (if you use my discounted price). Now here’s how to get started on your blogging journey! Not being a strong writer, or not enjoying writing. Being afraid of being judged. If any of these barriers sound familiar to you, you’re not alone. In fact, I’ve dealt with all three myself. BUT, I just started writing. This blog started out with my journey into yoga and it eventually led me to quit my job and study yoga in India (yep, true story). My “voice” (how I come across in my writing) developed over time, and eventually, I started to love the process of writing. Now I crave writing and it’s also what I do in my full-time career. As for fear of being judged, that’s always been there for me and it will never go away. The truth is, when you put yourself out there and share what’s in your heart, not everyone will like what you have to say. Some may say rude or hurtful things! But more importantly, you’ll find people that are like-minded; that share your ideas and appreciate your creativity. That’s the best part about blogging. The community. Want to get started? Check out this free tutorial that will get you up and running! 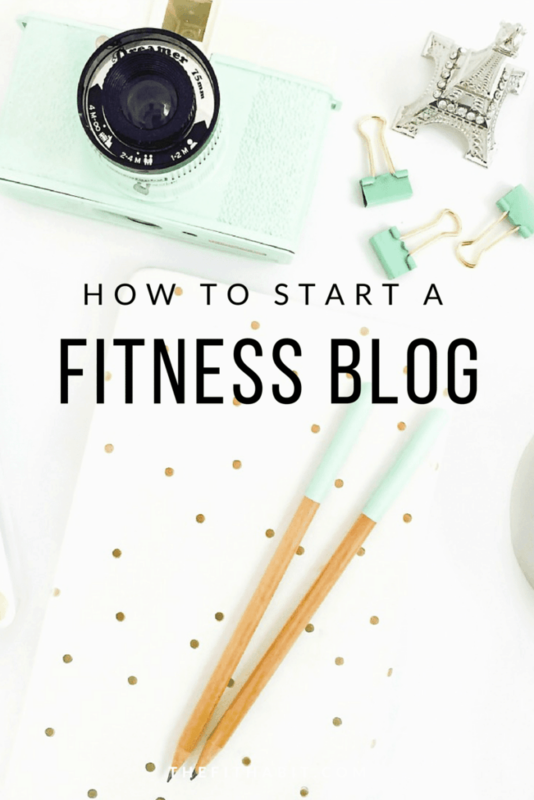 How to Start Your Own Fitness Blog Using BlueHost. In this tutorial, you will learn how to start a WordPress blog on Bluehost. It’s easy and takes just around 15 minutes! I recommend Bluehost for blogging because it’s the easiest and most affordable platform out there. 1. Register your domain name (for free if you use my link). This is what holds folks up, but my advice is to not overthink it. I came up with my name by writing down a bunch of words that define what I’m passionate about. Then I just started making combinations and checking to see if they were available. The Fit Habit wasn’t the first name of this blog, but it’s the name that stuck! 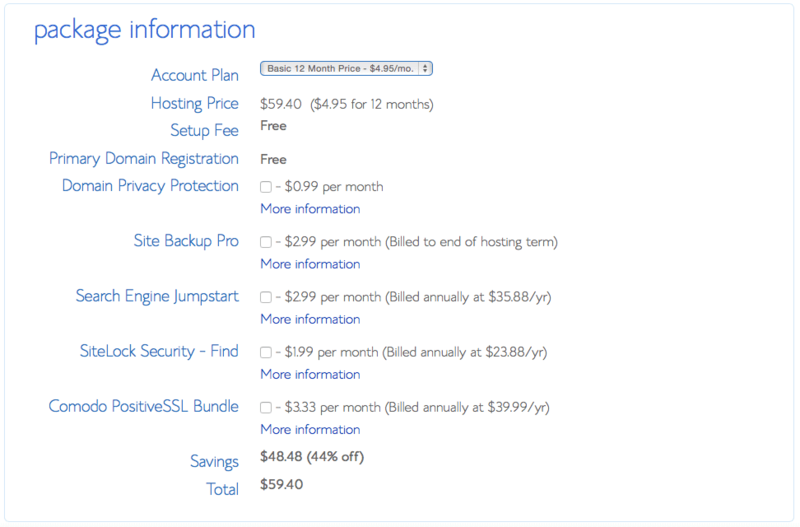 The beauty of signing up with Bluehost is that you get your URL name included in the cost of your first year of hosting. As I mentioned, Bluehost has one of the most cost-effective hosting packages out there, and their service is incredibly good. That’s why I switched from GoDaddy. Now, you can start your blog on Blogger, which is a different platform, but I wouldn’t recommend it. You don’t own that content and if you’re going to take blogging seriously (which you should), then be a pro right out of the gate. Using Blogger means you don’t even have a unique URL. So, for example, my URL is thefithabit.com, but if I went with Blogger, it would be thefithabit.blogspot.com. This tells your readers that your website isn’t your own. It’s like setting up your ice cream shop in the middle of Nordstroms. Get your own shop. Start by heading here and selecting the basic package. That’s all you need starting out. In this tutorial, you will learn how to start a WordPress blog on Bluehost. It’s easy and takes just around 15 minutes! I recommend Bluehost for blogging! This image will show you Bluehost basic vs plus plans. Click “select” and move on to the next page. 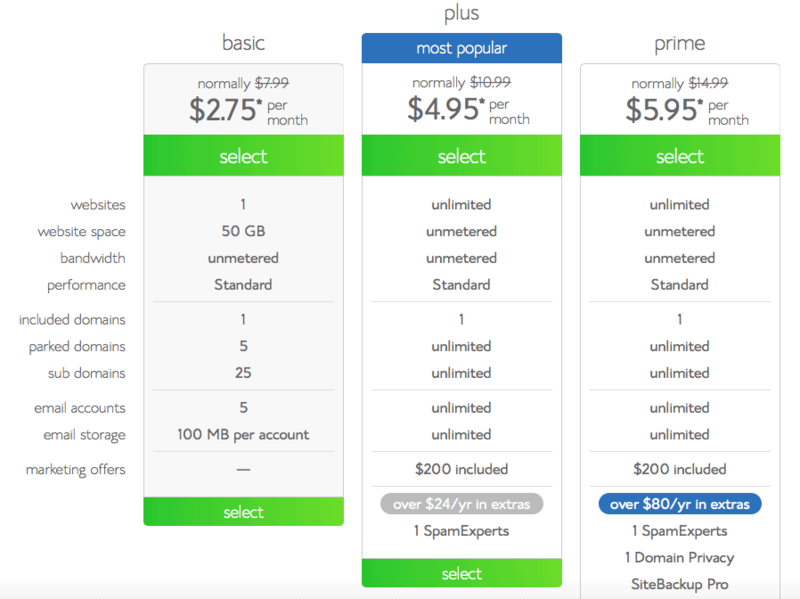 To get the best price, choose the basic plan and opt for buying the 3-year hosting up front. I know that seems like a long-term horizon, so if that doesn’t feel like the best choice, just go for 12 months. It’s more expensive, but that’s what I went with. I also purchased privacy protection at .99 cents a month. It’s a VERY small price to pay for a little-added security. BTW, there’s a full refund if you decide to pull the plug in the first 30 days and then a pro-rated refund for anything after that, so there’s no downside here! Click on the package you are interested in. Enter your domain name you registered with earlier, or sign up for a new domain name here. Next, you will be asked to enter a password. Make sure it’s secure as this information is very important. 3. Install WordPress on Bluehost. Now it’s time to install WordPress on your hosting account!! Think of hosting as your blog’s land and WordPress as the house you’re about to put on that land ? When you are in your cPanel (you will receive a link to this in your welcome email from Bluehost), find and click on the image that says “One Click Install.”. Click on the “Start” button. This will begin the installation. Once in the installation process, you will have to decide which domain you will want to install WordPress on. Click the dropdown menu to the domain you plan on using. Now, you will see “Advanced Options.” This is where you choose your username and password for your WordPress website. Pick something that’s not easy to hack! Write down your username and password somewhere you’ll remember. Once that’s done, Bluehost will then send you an email with your login credentials. Once you have them, go log into your WordPress account (remember, that’s your blog’s house) and then install a theme. Consider that the decor of your house! Rather than me walking you through that process, here’s a quick video tutorial that will illustrate the process. That’s it! Now you’re ready to start blogging. If you want a quick tutorial on how to post your first blog, see this video below. It may seem a little overwhelming at first, but once you get started, it’s a really simple framework to work with. You’ll be a pro in no time! Got questions on the process? Drop a comment below. I’m happy to help! Previous Post: « Make any soup recipe healthy.